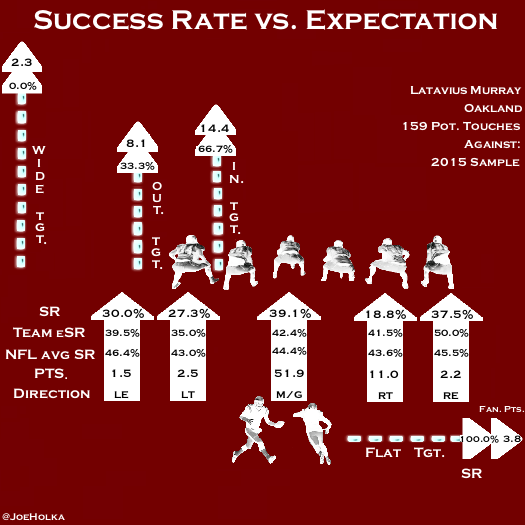 Rushing Expectation: Latavius Murray – If a Tree Falls and No One is There, Does It Make a Sound? This part of the season is filled with a ton of noise and narratives to sift through. It is tough to decipher what to listen to and what to read, as well as how quickly or how much your feelings should change given the reports from training camp. I would like to think if you are reading this you are on the right track already, as attacking these narratives with unbiased and undeniable data is often the path of least resistance. Latavius Murray is under a lot of heat in the fantasy community. This is mostly because even after posting a RB1 season, it is possible he might not be any good when you take into consideration his historical inefficiency in 2015. Let’s attack this from all angles. 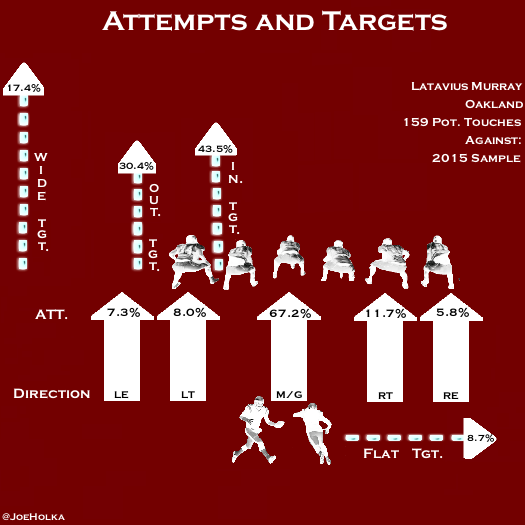 Can Murray Take Advantage of Oakland's Offensive Line? First, being any good might not be a requirement for fantasy success behind the Oakland improved offensive line this year. By improved I mean arguably as good or better than the Dallas Cowboys, the class of the league in this category. The Raiders signed Pro Football Focus’s third-highest-graded run-blocking offensive lineman this offseason, Kelechi Osemele, who is a huge upgrade at left guard from JaMarcus Webb. Chris Raybon wrote up Murray's prospects behind this offensive line in much more detail. The point is, whoever runs behind this line will be relevant. How relevant, for fantasy purposes, is the real question. The Raiders are going to be a much better team in 2016, not just because of their offensive line, but impressive additions to the defense including Sean Smith, Reggie Nelson, Bruce Irvin, and Khalil Mack. This favors the idea of an increase in volume for the running game under more frequent positive game scripts. Oakland ranked just 29th in the league in rush attempts last season, and ran the 12th-fewest plays with the lead in the NFL. Taking into consideration their offensive line and defensive additions, as well as their schedule, it is no surprise that Vegas have pegged the Raiders as underdogs in just four of sixteen games this season. For context purposes, Oakland was an underdog 11 times in 2015. Second-year offensive coordinator Bill Musgrave generally plays to his team’s strengths, which were namely Amari Cooper and Michael Crabtree last season. However, with a defensive minded coach in Jack Del Rio and a better outlook in the win column, it stands a good possibility that the team will rely more heavily on the power run game and less on the passing attack in 2016. This sounds like a lot of good news for Murray truthers, until you dig into the possibility of him losing his starting job to rookie fifth round pick DeAndre Washington. Murray’s workload of 307 total touches (fourth in the NFL) is likely to decrease after he handled 80% of the team’s running back carries in 2015, and Washington could be a big reason why. At this time Murray is still the favorite to lead the team in touches but Washington and his 82nd-percentile SPARQ score was intriguing even before the Raiders started talking him up as a complete back. 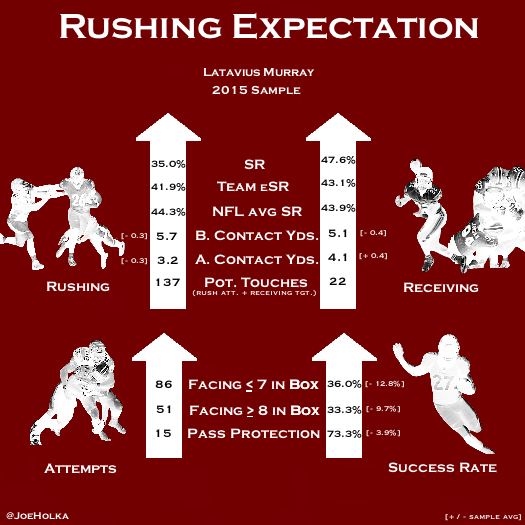 Before we go any further on the potential impact of Washington, lets use Murray’s 2015 Rushing Expectation sample to help us paint a clearer picture of his ability to fend off this kind of competition. The best way to describe Murray’s running style is that he seemingly glides with the football. We could call it unique or easily distinguishable -- in comparison to other backs I have charted so far, at least. Murray is a long-striding player whose best attribute is above average burst with a good ability to separate from defenders, though he doesn’t play as fast as his 4.38 forty time would insinuate. That still didn't hinder Murray's ability to break long runs: only three running backs had more carries of 20-plus yards than Murray did in 2015. An overwhelming percentage of his total rush attempts came through the middle lane at 67.2%. These are attempts that come behind the center, left, or right guard. His targets in the passing game represented just 13.8% of his total potential attempts (rush attempts plus targets). This was one of the smallest sample sizes of my initial 20 players, but unfortunately it just magnifies his mistakes. The former tight end has solid receiving ability and average hands, but had some glaring drops in this small sample. Getting open wasn’t necessarily an issue; Murray suffered from perhaps just a lack of concentration. 73.9 % of his routes came through the inside or outside lanes. I will continue to stress that my favorite and most useful metric is Expected Success Rate (eSR) metric. I strongly believe that not every Success Rate (SR) is created equal, and I think eSR does a great job highlighting this fact. The Raiders gave Murray a huge amount of volume in 2015 despite being linked to numerous free agent and trade situations over the past year, including both Adrian Peterson and Arian Foster. They are clearly not completely satisfied with their backfield or Murray’s performance. From an efficiency or metrics perspective, is this warranted? How far did Murray fall below expectations in 2015, and is he worthy of this type of volume again in 2016? The overall eSR for Murray and the Raiders was 41.9% per rushing attempt, 19th in the NFL but below the NFL average of 44.3%. Oakland was an average team in pass protection at 43.1% expectation, hovering right around the league average of 43.9% eSR. Murray was most successful through the middle lane, his largest sample, at a 39.1% SR. This was the worst SR through the middle lane of any player in my initial 20-player sample; next closest players were C.J. Anderson (39.6%) and Melvin Gordon (39.7%). As for the small distribution of runs to other lanes, Murray also performed well below his eSR and NFL average. He seems content to use jump cuts when in trouble instead of using his size to his advantage to gain leverage and power. His athletic ability is solid and his ability to change direction and agility behind the line is average. In the receiving game, Murray’s highest volume area was inside, where he found the most success at 66.7%. This is well above expectation, and Murray has shown in a limited sample that he can take a hit and maintain possession of the ball if you ignore his drops with no one around him. It’s becoming more and more clear that efficiency struggles of Murray are not being overblown in the community. If anything they are being understated. Let’s check out his overall Rushing Expectation results and gather more clues as to what went wrong. Murray ran behind what was statistically a middle-of-the-pack offensive line in 2015 and performed below expectation by (-6.9%) in the run game, but finished with an above average 4.5% above expectation in the passing game on a very limited sample. Murray’s lack of rushing efficiency put him dead last in my entire 20-player sample in regards to percent above or below expectation. Jeremy Langford was next closest at (-4.7%). Before Contact Yards are something I discuss at length in my introduction to Rushing Expectation. Elusiveness behind the line of scrimmage is an extremely underrated -- but prevalent -- ability among the league's best feature backs. Murray’s before contact yards (rushing) of 5.7 yards per carry was the sixth-worst of my initial sample. It's still early in this methodology and I want to again clarify a few things, so I apologize if you have been following along and this feels redundant. I chart yards before contact as the moment a player is handed the ball. I think what a player does as he approaches the line is just as important as what he does when he meets the line of scrimmage. After first contact, Murray posted a below average 3.2 yards per attempt. He has solid power, in particular against corners in the second level, and showed average finish to break through wraps and hits to his legs or below the knees. His balance through contact is average, especially through arm contact for such a big back. An encouraging development for Murray’s fantasy prospects was that he faced the second-highest percentage of eight or more in the box of any player in my sample (37.2% of his total attempts). The strides this team will make in general in 2016 should help remedy this a bit, though Murray’s SR was just 2.7% better against seven or less in the box. Murray has adequate mental processing skills but seems to only display this on large holes or where he makes the first defender miss. He cuts back far too much; his improvisational skills are average at best. The overwhelming theme of the running backs I have charted so far is that many can improve greatly in pass protection. Of 15 opportunities, Murray was an asset 73.3% of the time. Not a horrible number by any means, but this was still below average. The concern with Murray going forward has to be anchored by the fact that he is not only inefficient, but also isn’t consistent on a carry-to-carry basis. With Roy Helu headed to the IR, it cannot be understated that Murray’s main competition, rookie DeAndre Washington, excels where Murray is least useful. Murray finished fourth in snaps at the position, but just 19th in targets, averaging just 5.7 yards per catch and committing several memorable drops in 2015. I believe this fact alone could push this past the “just hype” category surrounding Washington. 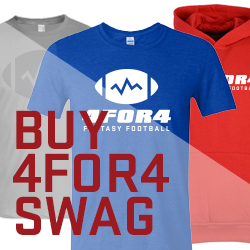 A loss in receiving production is a significant blow to a running back's value in fantasy. Washington has a proven track record of above average receiving ability, totaling 124 receptions in college, more than Murray has had in college and the NFL combined. It sounds to me that he is a player Oakland feels is fully capable in a three-down role if called upon. We’ve seen time and time again that teams have no problem going with the better receiver in close competitions. That said, at this time Murray is still the heavy favorite to lead this backfield in carries and the early schedule is extremely soft. It is quite possible that, barring injury, he gets off to a hot start behind this improved offensive line and doesn’t look back. At the same time, I wouldn’t be surprised if Washington forces himself into PPR relevance in a Giovani Bernard- or Duke Johnson-type role for the Raiders. It may take Murray falling on his face for this to happen, but its quite possible that has already happened in the coaches’ eyes, and that Murray will be on a short leash in 2016.